With precipitation records being broken in many parts of the country this past April, and severe weather events that included devastating tornadoes in the Midwest and Plains, flooding along the Mississippi and many other rivers, all in all it was a wet and wild April to behold. 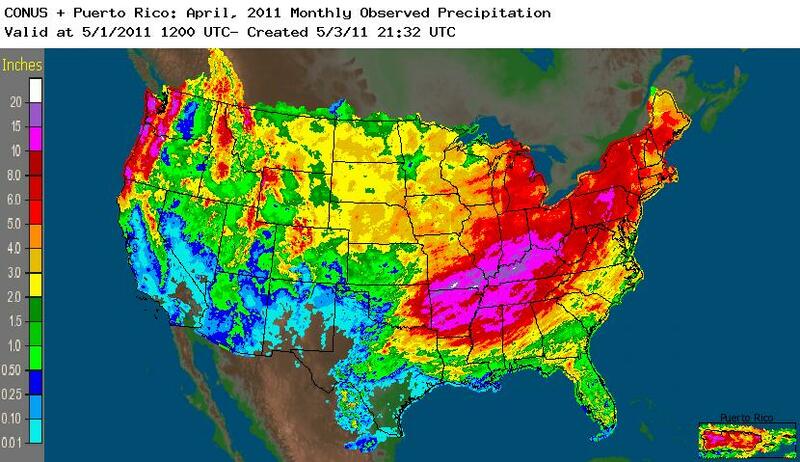 It probably comes as no surprise then that April 2011 was wetter than normal in Jackson Hole, as well. As a matter of fact it will probably go down as the "wettest" April on record here. While I do not have the "official" numbers yet from the US Forest Service's manually read climate station, I do have the numbers from the automated weather station that is located right next to the official climate station instrument shelter. 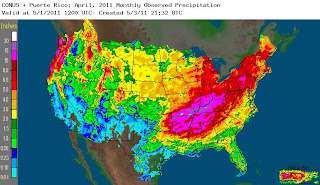 · Total precipitation for the Month of April 2011 was just over 3 inches. · Average High temperature in April 2011 was 45 degrees, normal high is 52. · Average Low temperature in April 2011 was 28 degrees, normal low is 25. · The warmest temp we had in April 2011 was 59 degrees on April 2nd . · The coldest temp we had was 15 degrees on April 23rd. The Month of May started out quite wet also, nearly reaching our average precipitation for the month in the first 10 days of the month. The automated rain gauge recorded 1.80 inches through May 10th. The average precip in Jackson in May is 1.88 inches. May, by the way, is normally the wettest month of the year, on average. According to the thermometer at the weather station, we’ve only had one day so far in 2011 that has topped 60 degrees (Cinco de Mayo). All that will be changing this week, with drier weather, more sunshine, and temperatures getting into the 60’s………for more than just one day! While we’d normally be seeing the snowpack shrinking in the mountains this time year, we’ve actually still been accumulating snow, and settled snowdepths above 8,000 feet have held there own the last month or so. The Tetons, Wasatch and parts of the cntral Colorado Rockies all have plenty of snow remaining in them this spring. See maps below. 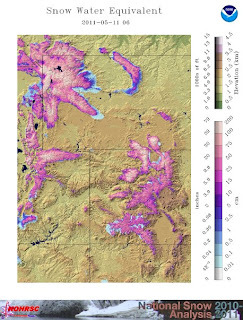 Maps of Snow Depth and Snow Water Equivalent (SWE) for WY-UT-CO region. The settled snow depth at the bottom of Rendezvous Bowl at JHMR (Elevation 9580-ft.) on April 1, 2011 was 142 inches. It was also at 142 inches on May 10, 2011. 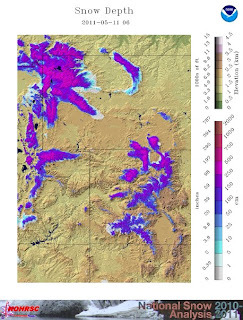 Snow depth at the Phillip’s Bench SnoTel site on the east side of Teton Pass (Elevation 8200-ft.) stood at 95 inches on April 1, 2011. It was at 100 inches on May 10, 2011. There is also 43.70 inches of water still contained in that snow yet to melt. Brace yourself for the run-off that is yet to come!